For the thrill-seeking person, roller coasters are a sure fire way to get the heart pumping and the adrenaline flowing. Indeed, coasters today are some of the most impressive feats of engineering on the planet. Some of these coasters come in at heights of over 450 feet and speeds at almost 150 miles per hour! In this list of the best roller coasters, we have compiled fan favorites, as well as coasters in the top of their class. So whether you are looking for speed, height, power, or a dizzying array of loops and turns, this list is bound to have the coaster for you. Plan a trip to some of these great roller coasters with our list of the best travel sites. The Millennium Force is going to feature an 80-degree drop and a roaring 93 mph speed. It resides at roller coaster mecca Cedar Point and is a star among roller coasters. The coaster also features an elevator cable lift system to bring cars more quickly to the top. This will help to ensure that every second of the 2-minute ride is well spent. Full Throttle coaster is one of the tallest and fastest looping roller coasters in the world. And, for loop fanatics, the 160-foot loop is done not once, but twice! So make sure you are ready to scream your lungs out on Full Throttle. To begin, the Gravity Max starts out with an impressive 90-degree angle, 34 story vertical drop. From there, the two and a half minute ‘tilting’ ride careens through a series of loops and drops. This coaster is sure to impress and thrill even the most avid rider. El Toro has was voted the number one wooden coaster in the United States. And, while El Toro’s appearance makes it seem like a typical wooden coaster, the 76 degree, 176-foot drop makes El Toro a cut above the rest. With a max height of 230 feet and a first drop of 215 feet at a 74-degree angle, the Diamondback roller coaster starts off with a bite. And with nine subsequent drops (10 total on the ride), it will be one thrill after another. Oh, did we forget to mention that this ride gets up 80+ miles per hour? Enjoy! The Beast, accurately named for its size, “sprawls” across 35 acres of wooded terrain. This monster of a coaster consists of wood and features a 4+ minute ride time. During this four minutes, you will experience a 135-foot drop, a 141-foot drop, and a 125-foot underground tunnel. Compared to “hiking a mountainside at 60 mph,” Boulder Dash is going to weave and wind through the wooded hills. This 2 minute and 30-second ride will have you smiling/full of terror the whole time. Outlaw Run consists of a double barrel roll (yes you heard that right) and 81-degree drops (which set a record). So it is safe to say that this is a coaster for those who apparently don’t experience fear like the rest of us. Outlaw Run is in Silver Dollar City and is a one of a kind roller coaster. Highlighting Medusa is 3 Zero-G rolls that are sure to leave your heart in your throat as you go through this ride. This coaster was originally made out of wood but was then updated with steel leaving the wooden frame. With a top speed of 58 miles an hour and 3,000 feet of track, Six Flags Mexico boasts one of the best roller coasters in the world. Covering over 2,500 feet of track and including four different inversions, Black Mamba is as scary as it sounds. Weaving in and out of the different buildings and rides around Phantasialand, this coaster like its name resembles a slithering fast moving snake. With top speeds of 62 miles per hour and a G-force of 4.2, the Helix’s 4,500+ foot track is going to have you loving every twist and turn of the ride. Completed in 2014 for a price tag of 30 million, the Helix is a roller coaster that shouldn’t be missed. So if you ever find yourself near Liseberg, Switzerland, make sure you checkout this great ride. With just under 3,500 feet of track, a max speed of 62 miles per hour and 4 inversions throughout the ride, Blue Fire is one coaster that is not to be missed. This is a launch coaster, so the ride starts out with a 0-62 take off that only takes 2.5 seconds. From here it only gets better as you twist, drop, and invert through the rest of the track. Taron is going to weave in and out of different buildings and themed pieces of the park giving it a one of a kind experience. With top speeds of just over 72 mph and sharp twisting turns throughout, Taron is sure to have you screaming your head off in pure joy throughout the ride. With a 4.1 G-force and a drop of 210 feet, Apollo’s Chariot at Busch Garden’s Williamsburg is truly a thrilling ride. Also, with nine different hills in the ride, Apollo’s Chariot is good for multiple rides. With one of the steepest drops in the world, the Takabisha coaster is not for those with a weak stomach. Recently built, the 121-degree drop of this coaster is a definite bucket list item for coaster enthusiasts. As the longest floorless roller coaster in the country, the Intimidator 305 is a favorite among roller coaster devotees. With non-stop action from start to finish, the 2 minute 6-second ride is well worth the time spent in line. Boasting an impressive 128 mph speed, the Kingda Ka is both the fastest and tallest roller coaster in the US. The top elevation of the ride is also a whopping 456 feet, making this ride a must for speed and height enthusiasts. As one of the fastest coasters in the world, the Formula Rossa at Ferrari World accelerates to almost 150 mph in just under five seconds. And, with 4.8Gs of force, ride goers have to wear safety goggles for the ride! Yes, the ride is only 17 seconds long, but those 17 seconds on the Top Thrill Dragster are magical! With speeds topping out at 120 mph and a height of 420 feet, this high-powered ride is a must for thrill seekers. Roller coasters are not for everyone, and that is okay. 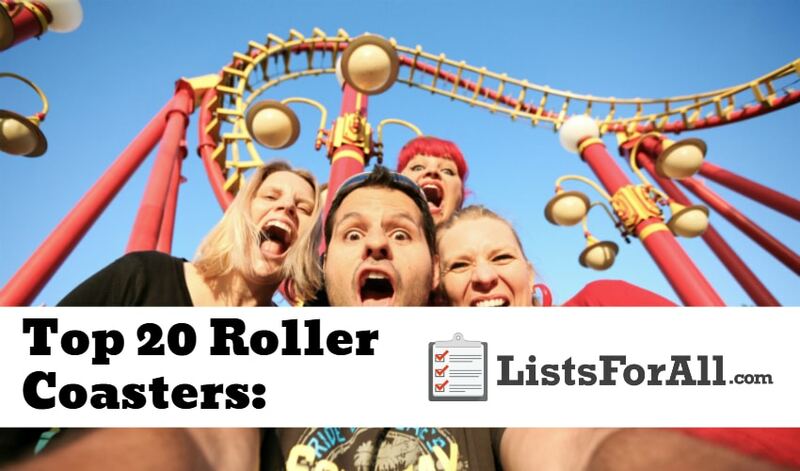 For those who do appreciate a good roller coaster though, this list has to have you fired up and ready to ride some of these great coasters! This list will provide you with the best coasters in the world. It was also going to provide roller coasters that are geographically spread out as well. This will allow you to have a better chance of being able to visit a couple of them. Let us know how your death-defying roller coaster ride went in the comments below. We would love to hear your feedback!